Installing a Monumental Markets automated market is much more than a change for micro market vending in Washington DC. It’s a statement that says you, as an employer, are committed to developing a sustained happier, heathier work environment. And, one of the best things about a Monumental Markets automated market is that it costs you nothing. Really, nothing. Installing a Monumental automated market is free and easy. Just give us a call and tell us what matters to you and to your staff regarding food options. Leave the rest to us. We will set up a welcoming mini-market precisely where you want in your work place. A Monumental Markets automated market does not need a lot of space either, so don’t worry about that. 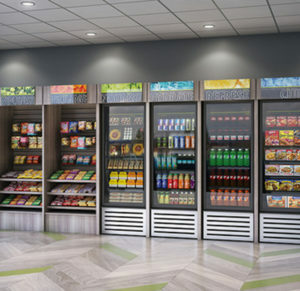 With an automated market stock full of healthy foods and drinks, you will no longer have to wonder where staff members are when they slip out of the office in the afternoons in search of an afternoon pick-me-up. That protein bar, fruit, or bag of healthy chips can be found right in the work place. You will quickly find that by providing access to healthy meals, snacks and beverages, employees are much less likely to leave the office to search for food options. Also, it is well documented that workers who eat healthy snacks rather than those indulging on high sugar and salt foods are more focused and more efficient. Imagine what this easy, reliable access to high quality healthy foods means for productivity! It is a very clear statement to your staff or potential staff that you care about them and their well- being when you install a Monumental Markets automated market. Most businesses cannot afford to provide free access to healthy food in nice settings like many of the tech giants today but a Monumental Markets automated market certainly helps you compete. Our automated markets are beautifully designed and welcoming and feature various modes of displaying products. They in no way resemble a lineup of vending machines bearing large logos of sugar drinks and snacks. Monumental Markets’ usage of state-of-the-art technology means that theft is not an issue and payment is simple. In fact, paying couldn’t be any easier or less of a hassle to management or staff. Employees can pay by a Monument Market card which they can monitor and refill on line, a credit card, or an employee id (should you wish to allow this option) and because of our use of cutting edge technology there are no refunds or erroneous charges to deal with. Showing your staff that you care about them while you reap the benefit of greater productivity is a win-win for all. So, give Monumental Market a call and find out how we can improve your image, your business and the wellbeing of your staff!